People on bicycles have the same rights and responsibilities as those driving cars with one small difference. Cars occupy a whole lane while those of us on bikes most often occupy only a portion of the lane. That said, where you position yourself on the road while riding your bike will vary depending on things like traffic volume/speed, lane widths, weather, lighting, and even your own comfort and skill level. If there are obstacles along the edge of the road like debris or even puddles that you need to avoid, you must ride further out in the lane. If there is a right turn lane only but you are going straight then you should stay out in the lane that is proceeding straight. Remember that you also have the same responsibilities as a motorist including stopping for red lights and stop signs. You can’t have it both ways, if you want to have your rights respected you have to follow the rules. Hand signals are one of the simplest and also one of the most important thing that you can do on a bicycle. As a person riding a bike you need to communicate with motorists to let them know what you intend to do. Amazingly they will often let you do just that as long as you signal your intentions. Remember to always shoulder check before you stick your hand out to signal. A shoulder check not only ensures that you are aware of traffic approaching from behind you, but also is a form of communicating to drivers that you want to change your position on the road. Shoulder check, signal and then before you move positions, shoulder check again. Make sure that your hand signals are clear by extending your arm fully in the direction you want to go. For more information on signalling check out MPI’s website here. Being visible to drivers is more than wearing bright/reflective clothing, it is about always staying in the driver’s field of vision. This means you need to avoid weaving in and out between parked cars or up onto the sidewalk and then back onto the road. And while you’re at it, stay out of the door zone. When passing parked cars you need to be at least 1.5 meters away to avoid the door zone. Stay visible, stay away, and you’ll stay safe. So how far should you ride from the curb? Generally you want to stay at least 1 meter from the curb or edge of the road. Staying further away from the curb allows you to avoid the plethora of obstacles and debris along the edge and also gives you room to manoeuvre should you need to avoid an obstacle. If you instead ride close to the curb, when you have to avoid an obstacle you need to move to your left and into the flow of traffic to avoid it. Staying further out from the edge makes you more visible and does not invite drivers to squeeze by you in the lane. Passing is always done on the left! Passing on the right unless you are in a dedicated lane (a bike lane would be a dedicated lane) is in fact illegal. More importantly you put yourself in a dangerous position as motorists may not see you there. You will also frustrate them, especially if they just passed you and are now forced to pass you again. The last thing you need is a frustrated driver behind you trying to pass! 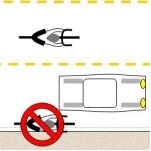 If you are in a bike lane and passing on the right, be alert to cars crossing over into the bike lane to turn. You also need to be watching for parked cars pulling out of parking spaces to the right of the bike lane. Keep your foot off the curb! It’s convenient and comfortable to sit on your bike seat with your foot on the curb, but it is also positioning you where you don’t want to be. Firstly when you start up you will have tonnes of steel right beside you. Secondly if the car next to you is turning right they just might hook you as you start across the intersection. As you approach an intersection, shoulder check, signal and move to a position in the centre of the lane. This way you are more visible to both the car in front and behind you. Riding on sidewalks is also illegal. More importantly statistically the sidewalk is the most dangerous place to ride. The reason is simple, intersection! Most car-bike accidents happen at intersection and the majority of these are a result of people riding on sidewalks. You have to remember that every back lane, driveway, etc represent an intersection if you are on the sidewalk, and most of these are not controlled. Drivers are simply not looking for a fast moving vehicle on the sidewalk and when you add in that in many cases there is limited visibility due to fences, trees and other objects it makes for even more potential for a car-bike crash. The simple solution is not to ride on sidewalks, however it is clear that many cyclists still feel safer on the sidewalk so if you must take the sidewalk, ride slowly (at pedestrian speed) and take extra caution at all intersections. Check out some of the great riding tips to help you enjoy Bike Week.